Summer in the land of mist leaves veils scattered carelessly across the landscape. Whole mountain ranges and islands can be swept in and out of view in moments, as the mist drifts through, trailing mystery in her wake. Some days the air is so still that the mist sits cloud like, unmoving, altering the familiar landscapes into vistas previously unseen. The sea shimmers like liquid silver, and a timeless air surrounds the earth. All sorts of people and creatures can cross through time in the veiled folds of warm summer mist. A hush holds the air breathless waiting for mystery to unveil herself and reveal the present to our hungry eyes. These photos were captured last month around Plockton and Kyle of Lochalsh, the day after a wild lightning storm. 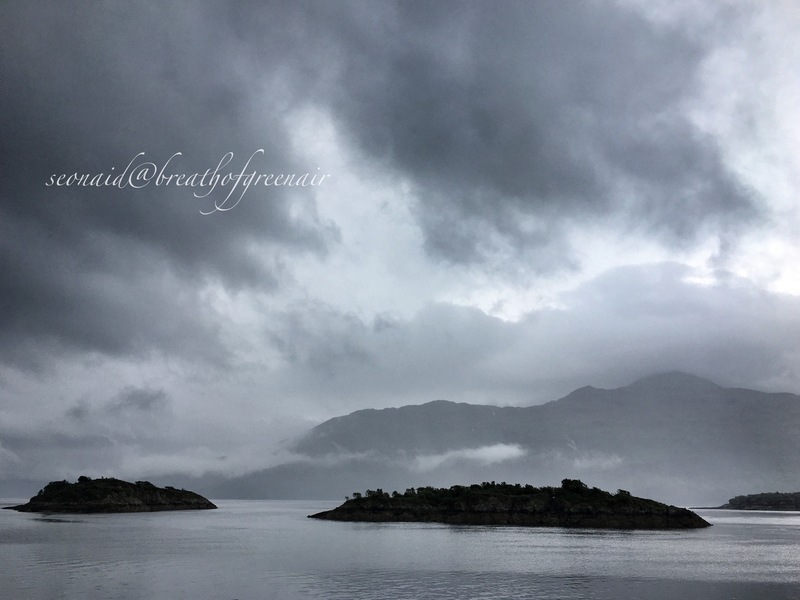 This entry was posted in elemental, nature photo, spiritual and tagged haunted, Highlands, landscape, magic, mindfulness, mist, mountains, mystery, nature, photography, scotland, summer. Bookmark the permalink. Amazing photos. I love to be reminded that there are places in this world that can transport us from the mundane day to day and remind us that the world is a wonder. I live next to a 14,000 foot mountain and the most amazing thing for me about it is that the clouds can hide all or part of it during the day. 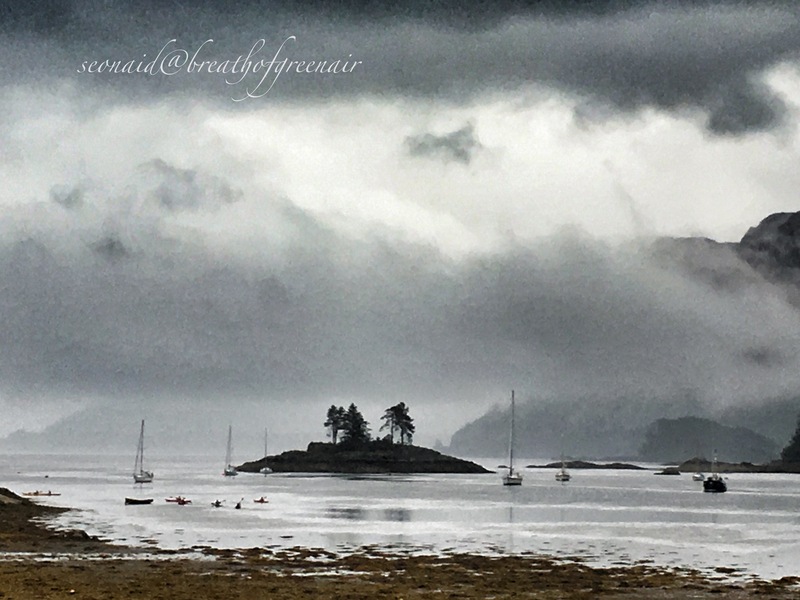 Strange how your photos’ glowing mystery swims beautifully in the mist, while my Plockton photos don’t…Lovely words as usual too. Hugs and love from us in Sweden – to all members of your family. Wow wow wow – gorgeous and mystical! Breath of fresh air! Gorgeous ..
You are using a colour camera, right? I first thought you had switched to B&W (a genre I enjoy greatly), but then saw a fringe of deep-tobacco beach beneath the B&W water, mountains & mist, proving that it was simply a largely B&W moment in a full-colour world. Lovely. Evocative. Mysterious and beautiful captures, Seonaid. Your words held me enthralled. Wonderful images, Seonaid…and I thought I recognised Plockton despite only having visited once, very briefly, in the pouring rain! Ha, it might look familiar cloaked in mist then? Still pretty though, and an air of mystery even in the rain!! Certainly an air of mystery! I will have to dig out my photograph….. Your writing and photographs are beautiful! WOW Seonaid, your photos are incredible. I imagine these scenes in ancient picture books! I realize the Lochness monster is not from these parts, but I could visualize it appearing. Hopefully, the lightning storm did no damage. Thanks for opening up your world to me! Hey Gwynn, Loch isn’t too far inland from here….maybe half an hour by car…..so who knows maybe the beastie, or even the beasties cousin might indeed appear between the folds of mist😜Certainly a selkie or two might pop up from the water!